Hmmm... 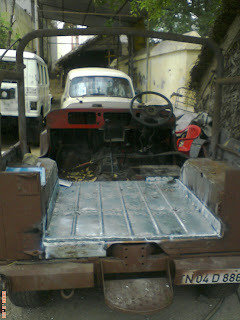 The jeep is reached a major restoration part in the past week, almost much of the rusted body surfaces have been replaced with a new anti-corrosion(coated) steel sheets of 18 Imperial Gauge thickness (1.22 mm). The work is on the runway speed and the whole body work team is motivated to achieve a optimum performance in the restoration project. 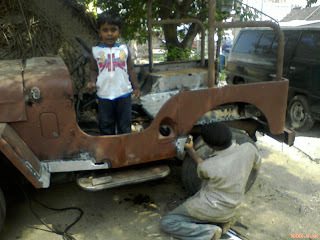 You know what my kid Adithya is the supervisor for the project, he never gets away from the work area & fully addicted to the jeep's restoration. As a result of last week's work, we could restore the platform to its original like condition. 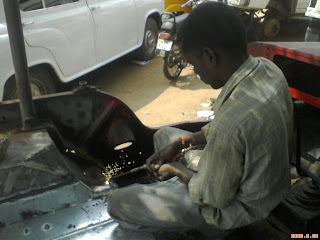 if you look at the below picture, the embossed lines in the rear platform are manually done by the chief Tinker. We have plans to move the Body tub away from the chase in this week for treating under body surfaces with Tinker and Painting solutions.